Ariela Levi | What The BIEC? 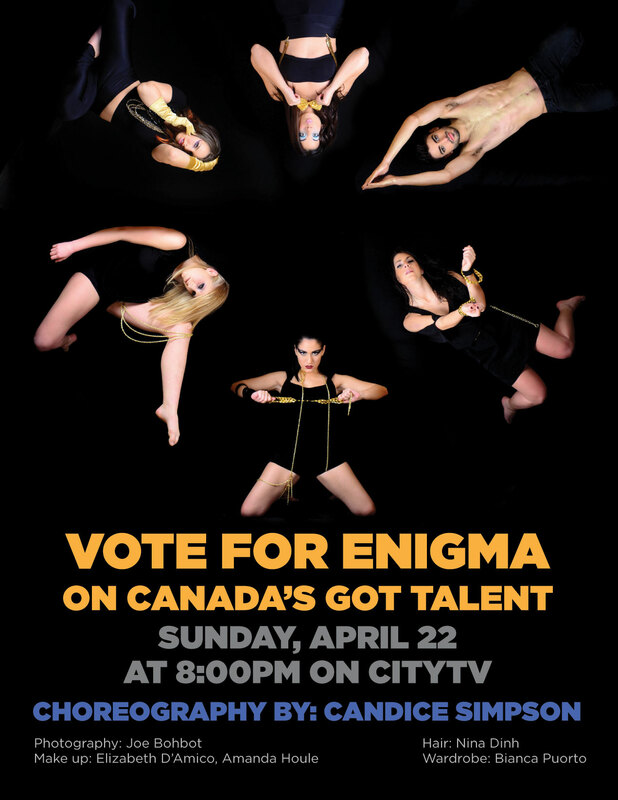 Vote for Enigma on Canada’s Got Talent! What do Mel Weinstein, Julie Goldenberg, Tracey Shwartz and Ariela Levi all have in common? Aside from being talented dancers in theMontrealbased dance production Enigma, they are all Taglit Birthright Israel alumni!!! In just over 48 hours, Enigma will take center stage onCanada’s Got Talent. The four girls along with their group members Florence Brais and Jade Hassoune first auditioned for the show inMontrealearlier in the year, but their story began in 2008. Enigma was born as a unique and inspirational dance outlet, whose mission was to bring awareness to and raise funds for Vision of Hope, a fund created to honor the late Ian Samberg who sadly lost his battle to cancer in 2007. Since then the group has managed to raise over $140,000 for the cause through two sold out shows, and has caught the attention of local and national press. This time around, the group won’t be looking for dollars, but rather your vote. On April 22nd as of 8pm you have five ways to show your support for them: by phone, online, facebook, text and twitter. For more information on voting please visitCanada’s Got Talent’s website here. From everyone here at team BIEC we wish them the best of luck on Sunday, you can count on our votes! Welcome to Team BIEC’s blog! Team BIEC is a group of young, Jewish community professionals who are dedicated to helping young adults find their place in our community. Free trips to Israel? We like those too! Find out more about us on the "Team BIEC" page, and check out posts by your favourite authors below. Check out posts by all our contributors! Meet Matthew Richman, the newest member of Team BIEC! !